We are super excited to announce some new makeshops and workshops in the coming weeks. You’ve already heard about the Valentine’s Card Makeshop on Monday, February 7th- there is still room; we’d <3 to have you. It will start at 7pm, costs $25, and includes an quick intro to Inkscape. You’ll walk away with custom Valentine’s Cards that you have made! Next Thursday, February 10th from 7-9pm we’ll be hosting a makeshop on Powder-Based Printing and introducing 3D Buried Treasure. This makeshop is $40. You get a 3D Buried Treasure, learn the process through which it was made, and practice excavating and finishing 3D prints. Sunday, February 13 2-4:30pm is our popular Intro to Electronics workshop. For $50, you learn the basics of using simple electronic components. This is the best starting point for making all of those projects you’ve seen in Make: Magazine. 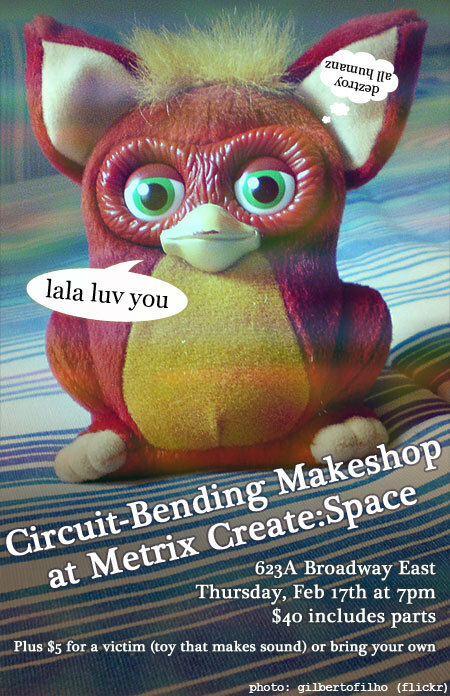 We are also super excited to announce another new Makeshop (see the flier at the top) in Circuit Bending. For $40, you will be led by an experienced circuit bender to mod your electronic toy (for $5 you can get a toy to mod if you don’t have one.). We will provide components. Inkscape for the Laser Engraver is a great way to get your design on for 2D design for the laser. Allison will be teaching the next instance on Saturday, February 19 2-4:30pm. The workshop is $50 which includes the material and laser time to cut out a simple test design you create that day. If you’ve been meaning to make that little robot and just haven’t managed to, Arduino Robots is the culmination of our introductory Arduino series. It uses the components and topics covered in Intro, Programming and I/O to create a line-following robot. Bring the materials you got in previous workshops and we’ll provide the rest. The workshop is on Sunday, February 20 from 2-5pm and is $50. Thursday, February 24 from 7-9pm, we are introducing our Intro to Using a Sewing Machine workshop. If you have a sewing machine, bring it. If you have a favorite fabric, bring it. We have sewing machines to practice on and will each make a pillow while learning about fabric, patterns, and using a sewing machine. For the $50 fee, we will provide fabric and stuffing for a pillow which you will take home with you at the end! Sunday, March 6 we have the popular Intro and Programming workshops in the Arduino series. Intro to Arduino is from 2-4pm. Programming for Arduino is from 5-7pm. These are a great way to get a foundation in using your Arduino for more Make: Magazine and other fun projects. Each workshop is $50; if you are taking the Intro workshop and would like an Arduino/cable, you can get them for an additional $10 material fee. The designer behind Imagination Hardware will be doing a workshop on Branding and Packaging on Thursday, March 10 from 7-9pm. Come join us to learn how to design a brand for your product and tips on creating professional-looking packaging. Participants need to bring a laptop with a design program installed (Photoshop, Adobe Illustrator, Inkscape, Corel Draw or InDesign etc). If you have one, bring your product or product idea to use as inspiration for the process. The next instance of our popular Intro to Electronics workshop will be on Thursday, March 17 from 7-9:30pm. Inkscape for the Laser Engraver will again be held on Sunday, March 20 from 2-4:30pm. speed control. You will need a laptop, an Arduino, and a USB cable. A protoshield and other require components will be provided. And on Sunday, March 27 from 2-4pm, come learn the basics of OpenSCAD from Nicholas, member of Open3DP and creator of RepRapBreeding. This workshop is great even if you have little or no CAD or programming experience. We will cover the user interface, basic shapes, transformations and Boolean operations, and exporting for 3D printing. Bring a laptop with OpenSCAD installed and a mouse with scroll wheel if you have it. We look forward to seeing you down here for these new exciting workshops!